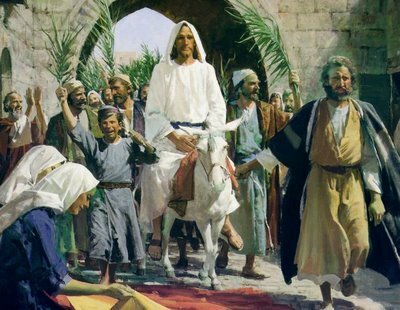 On the 14th of this month Christians observe “Palm Sunday.” It is the day that we commemorate Jesus’ entry into the city of Jerusalem on a donkey. This event began the passion week in which Jesus publicly presented Himself as the Messiah, was arrested, was crucified upon Mount Calvary and finally rose from the dead the following Sunday. Last month we considered a number of fulfilled prophecies involving the Messiah. But one of the most astonishing predictions was made by the Old Testament prophet Daniel, specifying the exact year in which the Messiah would appear in Israel. Daniel 9:24-26 was written at least 500 years before Christ’s birth. In this passage a timetable of 70 weeks (or 70 “sevens”) is laid out. Each of these “weeks” is actually a period of seven years. They are divided in this passage into three groups: an initial 7 weeks (49 years), then 62 weeks (434 years), and a final week (7 years). Verse 25 makes it clear that the 70 sevens would begin with a decree involving the rebuilding of the city of Jerusalem. At this point there is some historical ambiguity. There was an initial decree by Cyrus about 538-536 BC to build the temple (II Chronicles 36:22-23), and another decree of Artaxerxes (Ezra 7:11-26) issued in 457 or 458 BC, and still another in 444 BC by Artaxerxes (Nehemiah 2:1-8) that specified the rebuilding of the walls around Jerusalem. From the time of the decree to rebuild, there would be 49 years for Jerusalem to be completely built up. Then there would be an additional 434 years “unto the Messiah the Prince” (verse 25). Thus, if the Messiah was not on the earth 483 years after 444 BC (which would be AD 39) at the latest, Daniel was a false prophet and his book should not be in our Scriptures. But this amazing passage also predicted that the Messiah would be killed “but not for himself:” (verse 26). Between the years AD 24 and AD 39 Jesus initiated His earthly ministry, proclaimed Himself the Messiah and had was cut off as a sacrifice for our sins. This timetable is an incredible fulfillment of the prophecy given in Daniel 9! Posted on April 3, 2019 by dwoetzel.